← RAVENAlert USB Flash Drive: Better School Security and Peace of Mind? You have multiple gadgets that you like carrying around – from iPods and other MP3 players to iPads and smartphones. However, each of them has its own different charger. If you think about it, the reason why you bought these electronics is because they’re portable. But carrying wired chargers does not seem to be too “portable,” does it? Now there’s a solution to your dilemma! iGo Inc., an international manufacturer of innovative accessories for mobile electronic devices, recently received attention for its latest advancement, the iGo KeyJuice USB Charger. This all-in-one charger is light, compact and multifunctional, and it works well with syncing cable for your smartphones and mobile consumer electronics. It’s also foldable. Open it up to reveal a full USB 2.0 connector, a micro USB, and a mini USB. A second model has a full Apple connector, so you can make sure that your iPod, iPhone and iPad don’t run out of battery. Not surprisingly, CES 2011 gave the KeyJuice USB Charger an Innovations Design and Engineering Award. The iGo USB Charger reminds me of a toolbox, where I can get everything I need (even all at the same time) and still carry it around like a little bag. 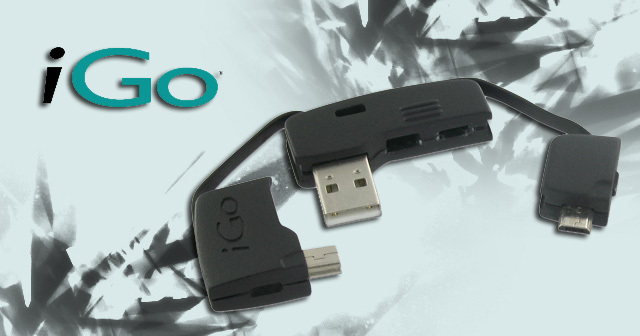 With its size and weight (less than a dozen grams), the iGo charger can easily be slipped inside the pocket or attached as a keychain with its built-in ring. It’s portable and convenient, just perfect for those that are always on-the-go. We barely see any downside, except that it’s really small and light so you really have to anchor it someplace safe so it doesn’t get lost. The device’s plain color also makes its appearance a little dull. Other than that, this USB charger is the best of its kind. The USB 2.0 charger is fairly priced at $14.99—a minor cost for portability and convenience. What do you think of the iGo KeyJuice USB Charger? Would it save you from carrying around too many proprietary chargers? Share what you think about the KeyJuice below! This entry was posted in Articles, CES 2011, iGo Inc., USB Charger, USB Devices, USB Gadgets and tagged "iGo" KeyJuice, CES 2011, iGo, iGo charger, iGo KeyJuice USB Charger, KeyJuice USB Charger, USB 2.0 charger, USB charger. Bookmark the permalink.